The routine has been the same since I was twelve, and flew home with my mother to see her Irish Catholic family for Christmas. She and I got separated as I was halted by a panicky TSA agent. I refused. I was new to hijab, but I was not going to remove my coat and expose my arms. Also, I was a brace-faced seventh grader surrounded by soldiers with M16’s and attack dogs. I did not want to feel even more naked and vulnerable than I already did–a kid two months post-9/11, surrounded by large people looking at me suspiciously, separated from my mother because I was wearing a jacket in December. The situation remains the same today. I dutifully stand in the long line, remove my two backpacks, my jacket, my sweater, and my shoes. 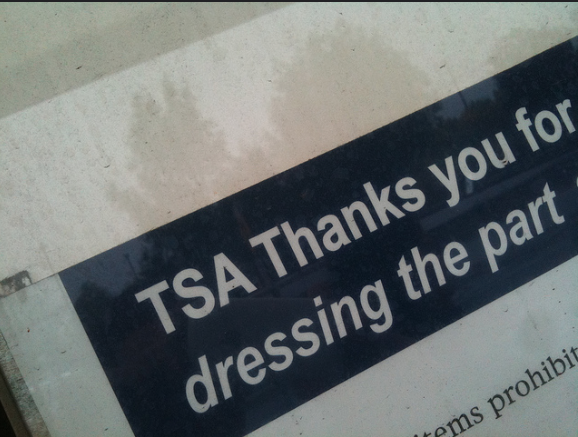 As I step forward, a TSA agent inevitably pulls me aside for “random” special screening. This always makes me feel just so, so special. It’s almost theatrical; an absurd theatre of security, which constantly makes me feel that I am dragged through tiresome and sometimes invasive measures so that the non-Muslim people around me will witness these ridiculous proceedings, and feel comfortable in the airport. What about my safety? TSA screenings routinely miss up to a shocking 96% of banned items in their screenings, and because they’re so busy worrying about me, it seems they don’t apply their screenings to all passengers. Am I getting x-rayed, body-scanned, patted down, put in a wind tunnel, having my hands swabbed and scanned, and having my bags opened and dismantled, only to still be at risk on a flight? Similarly, what about my comfort? My comfort and my happiness as a customer of these airlines and these airports is sacrificed regularly, and it is not only visible, veiled Muslim women like myself who are made to feel as though we are automatically suspect when we enter airport security. This outright xenophobia extends beyond people who are actually Muslim, and beyond security checkpoints, to people who are removed from their flights because they look or sound Muslim. This is exactly what happened to Waris Ahluwalia when he attempted to board a flight. Detained at security, he was told to remove his turban, a practice and symbol of his Sikh faith, and refused. Subsequently, Ahluwalia missed his flight. Ahluwalia’s story appeared on Comedy Central’s The Daily Show, with Muslim correspondent Hasan Minhaj interviewing Ahluwalia and several other members of the Sikh community. Minhaj also took to the streets of NYC, asking citizens to identify which in a series of four photos depicted a Sikh man. Many people painfully (and hilariously) failed. That same week, an Iraqi-American student was removed from his Southwest flight for using the common Arabic phrase “In sha Allah,” shortly after a Muslim family was removed from removed from a United flight, right after a Muslim woman of Somali descent was removed from yet another Southwest flight, right before a Minnesota TSA employee revealed he was told to target people of Somali descent…are we seeing a pattern here? Ahluwalia’s experience denotes the frightening spread of Islamophobia and its impact on diverse Americans, and as Ahluwalia and other Sikhs interviewed by Minhaj attest, this abuse is not limited to airports. Recently, there has again been an increase in attacks on Sikh Americans, fueled by Islamophobic media and political rhetoric, and the fact that Sikh Americans are so often mistaken for Muslims. Ahluwalia remains consistent in saying that he will not remove his turban or otherwise change his appearance in order to avoid discrimination. Further, he and other Sikh Americans, rather than attempting to distance themselves from Muslims, have taken a firm stance against Islamophobia by standing with Muslims, and decrying the true source of the discrimination and violence against both communities: fear-based demonization of Muslims in the media, and by political candidates. It is because of the Muslims the Sikhs have to suffer in USA, and Canada. How can you say that it is because of the Muslims. its not a Muslim person’s fault that they have to suffer because of discrimination and islamophobia as well. But just because they do that doesn’t mean that it’s because of them that Sikhs suffer. Khadija. Tell me how come that the screening of people / passengers started at the Airports around the world? Khadija. ” they have to suffer because of discrimination and Islamophobia as well ” Exactly , because of it, and who created discrimination and Islamophobia by who’s action? There is worst type of discrimination in Muslim countries against Infidels. Most of Muslim countries have Infidelphobia . like Saudi Arabia .